Don't buy fallen stars, find them! These Aren't Your Average Treasures. 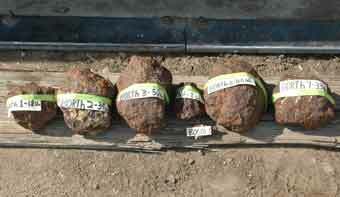 Meteorites are Older and More Valuable Than Anything Else You Can Dig Up! When most people think of buried treasure, the image of Spanish gold bars and Pirate's loot comes to mind, buried hundreds of years ago for safe-keeping. But beneath those traditional treasures and easier to find, lies something much valuable than gold and diamonds combined - and that treasure is meteorites. 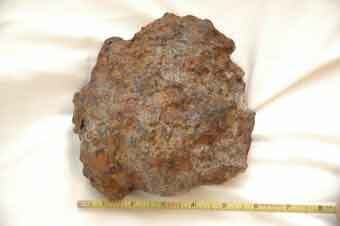 A meteorite is more commonly known as a fallen star or moon rocks. They are pieces of space debris that have landed on the earth's surface after surviving a fiery journey through the layers of our atmosphere. Each one is unique in shape and size, and is made of either stone or iron. The iron meteorites that lay beneath the surface are heavy and instantly stand out as unusual. The most common meteorites are made primarily of iron and nickel, referred to as "Iron," "Stony Iron," or "Chondrite" meteors - and these are the kind that you and your metal detector can find! Meteorites are rarer than gold, platinum, diamonds or emeralds. Owning one is the only way to touch the cosmos, and the demand for such an experience is quite high all over the world! Many have called them the "truest form of black gold," and they often sell for $300.00 per gram or more - meaning a 1 pound meteorite can be worth a million dollars. Where can a Meteorite be found? Meteorites are entering the Earth's atmosphere each day, amounting to more than a hundred tons of material! Fallen meteorites are witnessed about 33% of the time and the rest go unnoticed. According to the data base of the Meteoritical Society, about 1500 verified meteorites have been found in the U.S. in the past 200 years - and with today's advances in metal detectors, the number goes up every day! Start at home : 291 meteorites have been found in Texas, 177 in California, 214 in New Mexico, 50 in Nevada, 85 in Arizona, 17 in Alabama, and 136 in Kansas!! Almost every single state in the U.S. has been home to a meteorite at one time - even Hawaii! The best place to start looking for these valuable rocks is in deserts, if you happen to live close to such an area. Since they are devoid of plant life and rarely have rain, these are great places to look because the meteorite will not weather or erode quickly, and can be found just below surface. Next are "Strewn Fields" - These are fields that have clearly been the landing place of meteorites and have often been searched by others - but that can be in your favor. 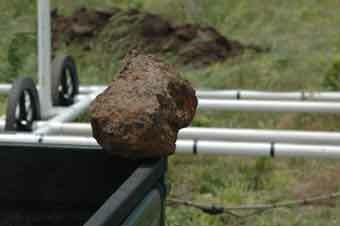 With the advances in metal detecting technology, many of the meteorites found today are pieces of ones found years ago. After you've picked out a good location and done some research, the first thing you'll need is a high quality metal detector that can help you find a coveted and valuable meteorite. Most metal detectors will locate iron, but you'll want one that covers a large area and penetrates much deeper into the Earth to find the more valuable meteorites. This includes the entire Quantro Sensing line of metal detectors for both land and water, which are specifically geared to locate large iron items and penetrate to great depths. Lorenz metal detectors, especially the Lorenz X5 and/or X6, have been a favorite for a number of Kellyco's customer's meteorite discoveries worth tens of thousands of dollars. Other recommended metal detectors for meteorite hunting are Minelab's Safari, E-Trac, and CTX-3030. White's Spectra VX3, Spectra V3i and MXT All-Pro, Fisher's F75, Teknetics's T2 as well as the Garrett GTI 2500 with the depth multiplier. (If you're not sure what detector to use, please call any of our certified metal detector experts toll free at 1-800-898-6673 & 1-800-327-9697). It has been reported that scientists have successfully found meteorites in the cold depths of Antarctica thanks to the help of metal detectors. Some have felt that the ability to ground balance or cancel out the dominate background rock has been the most important improvement to metal detecting technology over the years, and has allowed them to find meteorites in glacial moraines. Thanks to the help of a metal detector, twenty meteorites were found in only four hours of searching in Antarctica. Several Kellyco customers have spent years dedicated to finding meteorites right here in America, and our good friend Murry Crowe at Mojo Outdoors found one that weighed 49 pounds! He later recovered 9 others in the same area with his Lorenz DeepMax III purchased from Kellyco Metal Detectors. (Latest Model : Lorenz Deepmax Z1). Many meteorite hunters have found this to be much more than just a hobby, and have become very serious meteorite hunters. Among the legendary stories that many hobbyist share there is one of a hunter who grossed over a half million dollars in meteorites found around the world. One such meteorite was sold for $50,000 in auction. How Can I Tell if I Found One? Most metals found on Earth are either man-made or a meteorite. A piece of metal without holes or bubbles in it may be a meteorite. If you think you've found one but aren't sure, rub your find on a piece of unfinished ceramic tile. If the streak is red, the mineral is hematite and not a meteorite. If you don't have any ceramic tile lying around, try to break a piece of your find off. If it is a meteorite, it will be similar to naturally-occurring steel, and you probably won't be able to break it no matter how hard you try.